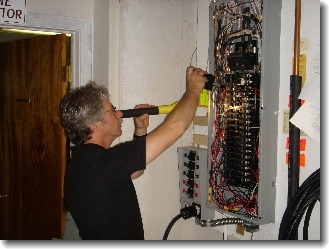 The inspection of the electrical includes, the service drop, the service entrance conductors, cables, and raceways. The service equipment and main disconnects. The service grounding. The interior components of the service panels and sub panels. The conductors, and overcurrent protection devices. A represenative number of installed lighting fixtures, switches, and receptacles, and the ground fault circuit interrupters. Also include is the amperage and volt rating of the service, location of main disconnects and sub panels. The wiring methods. Aslo report on the presence of solid conductor aluminum branch circuit wiring. The inspection does not include, alarm systems, low volt wiring systems and components, or the measurement of amperage, voltage or impedance.